Simple setup of blur nodes with exponentially increasing size, added back to the input successively. State: production-tested. 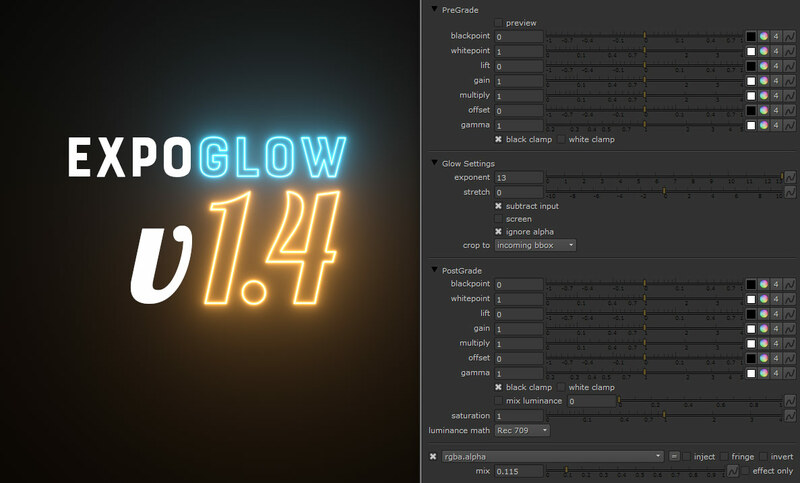 expoglow features a pre- and post-grade section, colour shift settings and a mask input, that behaves the way it should – masking the input, not the glow itself. Update 1.1: fixed a bug that caused alpha.red / alpha.green channels to pop up in some environments. Update 1.2: took out some internal stuff that wasn’t needed. And a friggin Viewer. Update 1.3: improved internal merge and crop behavior for performance and stability. added “mix luminance” control to post-grade section. altered “crop to” options to make better sense. Update 1.4: fixed internal naming stuff. found another viewer. I really need to work on those. 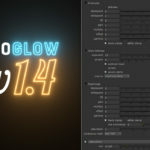 Take that native nuke glow node by the neck, beat some bloody sense into it, throw it out the door and never touch it again - expoglow to the rescue! The updated properties panel in version 1.3.